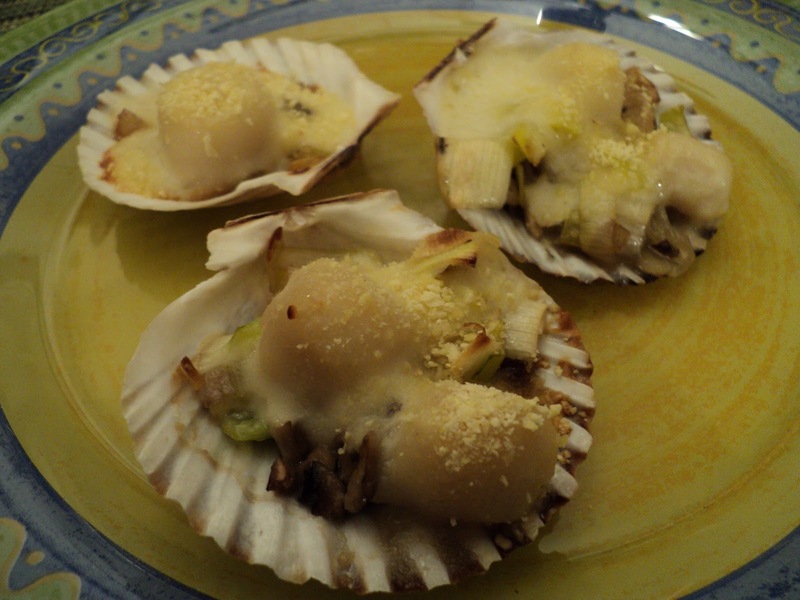 This dish has grilled shallots, leeks, and mushrooms (the huge champignons de Paris type that come from Holland), a béchamel sauce with white wine and, of course, scallops, known here as Coquilles Saint Jacques. The story: over the Christmas holidays, my in-laws came for about a week. What to serve? Mexican food--again? Shepherd's pie--again? Non, non, non. I needed to "jump in without my swimmies" -- an expression I heard in a movie recently. My mother-in-law's a fabulous cook. She arrived with numerous copies of Cuisine Actuelle and various cookbooks, and one night we sat and perused them all at the dining room table. This dish jumped out at me. It was time to leap in. Okay, so that first time, we made it together, and it was awesome... My sauce was actually lumpless. So, I made it again--alone--for more guests at New Year's... and again when another guest came recently, as you see here.